CBS News has confirmed Republican Sen. Sam Brownback, the Kansas conservative who struggled to raise money and gain recognition in the 2008 presidential campaign, will drop out on Friday. Melissa Brunner, of WIBW CBS Topeka, spoke with Christian Morgan, chair of the Kansas Republican Party. They are assisting Brownback in holding a press conference tentatively scheduled for late afternoon tomorrow. Money was a main reason for his decision, said one person close to Brownback who requested anonymity because the candidate had not yet announced his plans. Brownback is expected to announce his withdrawal in Topeka, Kan.
"Brownback has been unable to get traction in key states like Iowa where he has spent most of his time and effort," said CBSNews.com senior political editor Vaughn Ververs. "If Brownback does leave the race, it could provide some marginal help for a candidate such as Mike Huckabee who may gain support from activists dissatisfied with the front-runners in the race but is unlikely to have much of an impact overall." 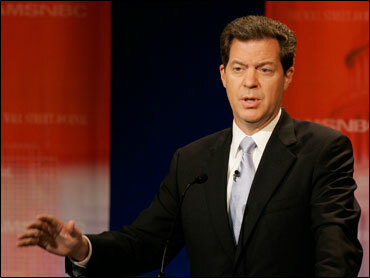 It's widely anticipated Brownback will run for Kansas governor in 2010, when his term - his second - expires. He had promised in his first Senate campaign to serve no more than two terms. "He also mentioned he is really looking forward to spending more time in Kansas," the person said. As recently as last week, Brownback indicated he would keep campaigning through Iowa's first-in-the-nation presidential caucuses in January, saying he would exit the race if he finished worse than fourth there. But his fundraising has sagged. Reports released Monday showed that of the nine Republican candidates, Brownback was seventh in fundraising from July through September and had a mere $94,000 cash on hand, less than any of his rivals. Brownback raised nearly $4 million overall and was eligible for $2 million in federal matching funds. He spent a good chunk of his money on the Iowa straw poll, an early test of strength whose significance diminished after Arizona Sen. John McCain and former New York Mayor Rudy Giuliani decided not to compete. He finished third in the August contest behind former Massachusetts Gov. Mitt Romney and former Arkansas Gov. Mike Huckabee. The straw poll gave a boost to Huckabee, said Chuck Hurley, an influential Iowa conservative who is friend and adviser to Brownback. "Brownback's campaign didn't catch fire," Hurley said. "It's just the field is still so full, and the pool of voters he was most fishing from was almost perfectly split between him and Mike Huckabee." Hurley said Brownback called him Thursday morning to say he was dropping out. Nationally, Brownback had the support of 1 percent of Republicans in this month's Associated Press-Ipsos poll, after peaking at 3 percent in June. Besides money, Brownback was hurt because he supports a path to citizenship for illegal immigrants, an issue that angers conservatives who influence voting in Iowa and other states that are struggling to provide education, medical care and other services to an influx of immigrants in recent years. People close to Brownback said it was unlikely he would endorse another candidate on Friday. It's uncertain how much weight a Brownback endorsement would carry. While the anti-abortion senator is a favorite of religious conservatives, he failed to become their consensus candidate and ranks low in national polls and state surveys. Still, a nod from Brownback could bolster the conservative credentials of a candidate such as McCain or Huckabee, the rivals who appear most likely to receive his support. Brownback and McCain are close Senate comrades and have refrained from criticizing one another, instead assailing Romney. While McCain has a voting record similar to Brownback's on cultural issues, McCain prompts skepticism on the right flank of the party because he isn't a high-profile crusader against abortion rights and gay marriage. Brownback's backing could signal to Christian conservatives that they can trust McCain. Campaigning in Spartanburg, S.C., on Thursday, McCain said of Brownback, "I'll miss him in this debate. He's a voice for family. He's a voice for the pro-life movement and community in America." Huckabee, a Southern Baptist preacher, is another favorite of religious conservatives. But like Brownback, he has struggled to rally that voting bloc around his candidacy. He, too, could benefit from Brownback's backing. Huckabee, campaigning in Rindge, N.H., declined to comment on Brownback's withdrawal because he hadn't heard it officially. It's harder to imagine any other Republican in the field getting a Brownback nod, although former Tennessee Sen. Fred Thompson is a possibility. The Kansas senator has bitterly criticized Romney, and Giuliani is disliked by many religious conservatives because of his abortion rights and gay rights positions.